Often it is necessary or desirable to balance the light intensity in one part of a scene with another. This is especially true in situations where you don't have total light control, as in bright contrasty landscapes. Exposing for the foreground will produce a washed-out, over-exposed sky while exposing for the sky will leave the foreground dark and under-exposed. Hitech Grad ND filters are part clear, part neutral density (available in grades of .3 (1 stop) to .9 (3 stops)). They allow the transition to be blended into the scene, often imperceptibly. Hitech combination filters are like two filters in one. 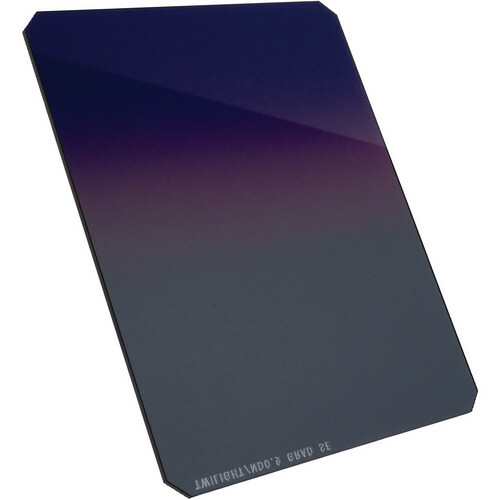 This filter is a Hitech Twilight filter combined with a graduated grey neutral density filter. Box Dimensions (LxWxH) 4.8 x 4.5 x 0.1"